For those of you who have never heard of this before, Nordic walking is essentially a cross between cross-country skiing and regular old walking or jogging. That may sound strange, but let us elaborate. The idea behind the workout is that you walk or jog with the aid of two poles (the same kind that you would use in skiing). The poles provide an extra level of balance as well as stimulation for key muscle groups in the abdomen and in the arms. Nordic walking is also great for exploring the wilderness. 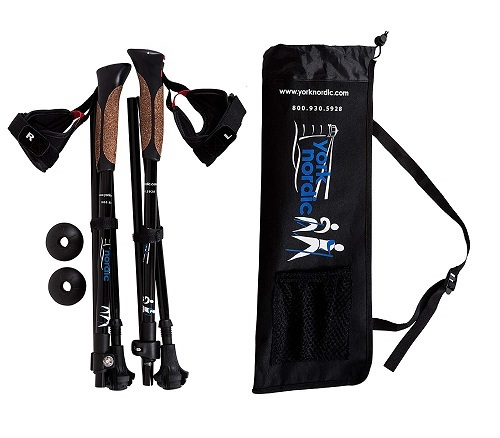 If you are interested in giving Nordic walking a try, all you need is a set of Nordic poles. In this article, we are going to look at the top 5 Nordic poles and give you the pros and cons of each. These poles are well designed for long walks on hot days. The grips are very comfortable and made from a very nice foam. Plus, they are pretty absorbent, which means that you do not have to worry about the handles becoming sweaty on long walks. 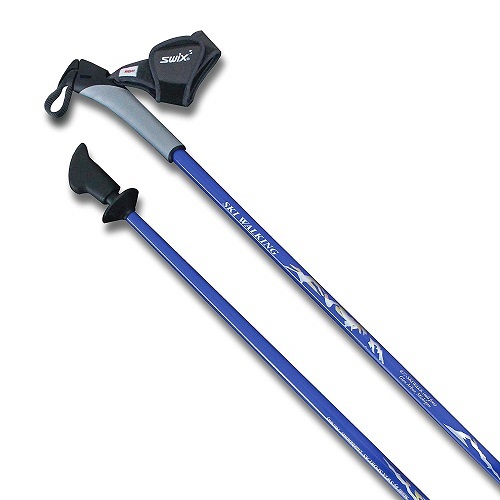 Nordic walking is best done in long sessions, so the fact that these poles are good for long sessions is a big plus. The poles come with an anti-shock mechanism, meaning that when you use them, you do not feel any resistance when the poles hit the ground. This makes the poles great for older people or people who may lack upper body strength. But, even if you do not fall into either of these 2 groups, you will still appreciate how much more comfortable Nordic walking is with these poles. Finally, the poles are also very easy to adjust on the fly and to lock into place. So, if you start walking and notice that you do not like the pole’s length, you can easily adjust it. This also makes collapsing and storing the poles extremely simple. The only real issue with these poles is that they can be a bit slippery on certain surfaces. Because of the material used on the bottom of the pole (hard plastic) and because of the way the pole is designed, certain surface likes tiles or stones, may seem very slippery. Depending on where you use the poles, this could either be a major issue or no issue at all. These poles are extremely durable. Even though they may look thin and flimsy, do not let the appearance fool you. The ends of the poles are made of high-quality metal, so there is no risk of them breaking or bending in outdoor environments. Also, just because the poles are durable does not mean that they are heavy or difficult to use. On the contrary, the poles are extremely lightweight and are perfect for people who may have issues using heavier poles (such as elderly people, people with muscle issues, etc.). As an added bonus, the poles come with a helpful hand strap to make them even easier to use. A big issue with these poles is that they are one-piece, meaning they do not collapse. Now, depending on the size of the pole you get, this may not be an issue. But, if you get a long pole, then you will find it difficult to travel with it, as it is far too long to fit in any suitcases. Also, because they are adjustable, if you do not get the right size, then your only option is to return it and get a new pole. This pole is easily adjustable and comes with an easy to read scale, so you can easily adjust the pole to whatever length you want with no guesswork involved. The actual performance of the pole is nice as well. It has steel tipped ends so that you can easily traverse uneven or rough terrain. It also has an anti-shock system, which also helps when traversing rough and uneven terrain. 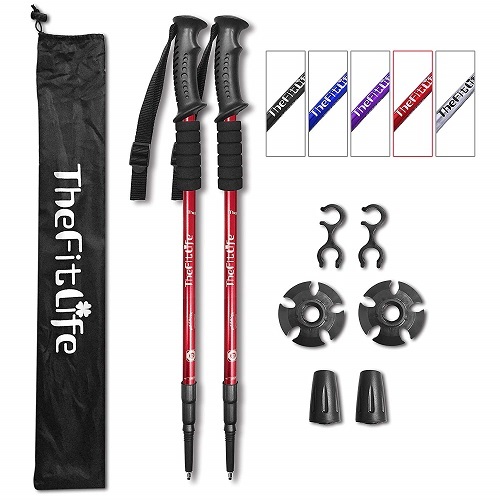 Finally, the fact that these poles are made from a very durable metal makes this one of the best walking poles for people who plan on going through rough terrain like heavily forested areas, rocky areas, etc. The biggest, and really only, issue with these poles is the lack of a comfortable grip. The grip is made of a hard plastic/cork combo that makes it difficult to use the pole for long periods of time as the handle will become quite uncomfortable. As you can probably tell from the name, these poles are great for traveling for 2 reasons. 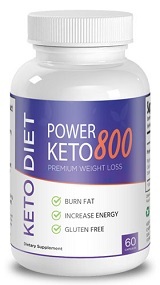 Firstly, they weigh around 9 ounces and are thus extremely lightweight and easy to carry. Secondly, the poles fold up very easily, meaning they can be stored in bags of all sizes. Plus, the actual poles come with a custom-made travel bag to make storage and transportation even easier. Also, because they are from York, the poles are extremely durable and guaranteed to last you a long time. York has a reputation for making very durable, sturdy walking poles and these ones are no exception. The poles could have benefited from some sort of anti-shocked system, as you can feel small vibrations in your arm when you walk with the poles. This is due to the internal components of the pole (which allow it to be folded) vibrating when you use them. This is not a huge deal, but it will annoy plenty of people. Like all Nordic poles, these ones are extremely durable and sturdy. 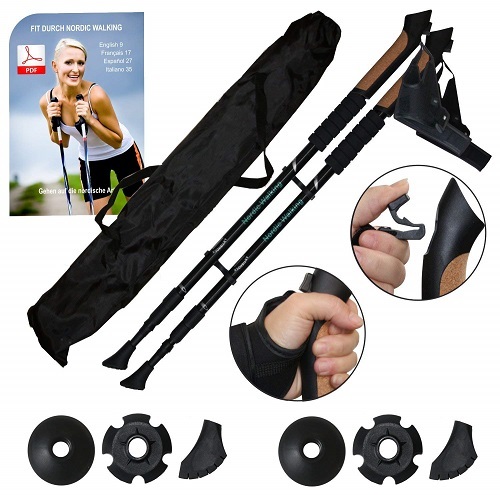 You do not need to worry about Nordic poles breaking on you. But, just because they are durable does not mean that they are heavy, York poles are made from very lightweight material. 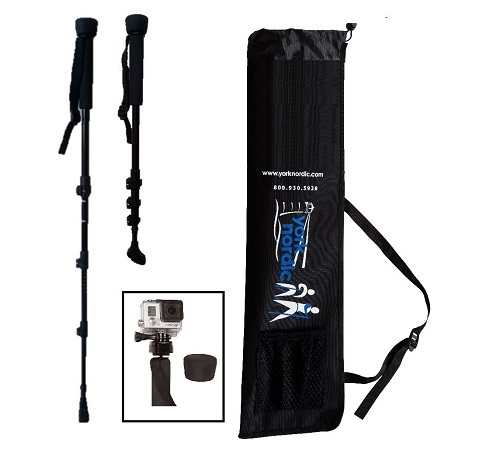 As an added bonus, these poles come with a helpful camera mount, allowing you to mount a camera and capture photos or videos very easily. Finally, the grip is extremely comfortable. No one should have any issues using this grip for long periods of time. The cushion they put on the grip is great and does a good job of both absorbing sweat and keeping your hands cushioned. A big issue with these poles is that while they may be collapsible, the actual process for collapsing the poles is very cumbersome, especially when you compare it with other poles on the market, which collapse much easier. Also, the pole comes with a number of removable parts, which can be very easy to lose. This is a very minor issue, but one that we thought was worth mentioning. Next Next post: How Does Strength Training And Cardio Benefit Bone Health?